Every spacecraft mission has at least one moment of terror. For OSIRIS-REx, mission success comes down to the five seconds when our Touch-and-Go Sample Acquisition Mechanism (TAGSAM) “kisses” the surface of asteroid Bennu to acquire a sample. Our TAG-based sampling approach is the result of over ten years of research and development efforts. OSIRIS-REx mission success comes down to the five seconds of surface contact. To Land or Not To Land? Our first key decision focused on whether we should land on the asteroid or develop a Touch-And-Go (TAG) strategy. We found many challenges associated with landing on an asteroid. As I described in a prior post, the gravitational acceleration on the surface of Bennu is 100,000 times smaller than that at the surface of the Earth. Any spacecraft that comes into contact with the asteroid surface in this environment is likely to bounce right back into space. Thus, landing on an asteroid requires some method to stabilize the spacecraft. 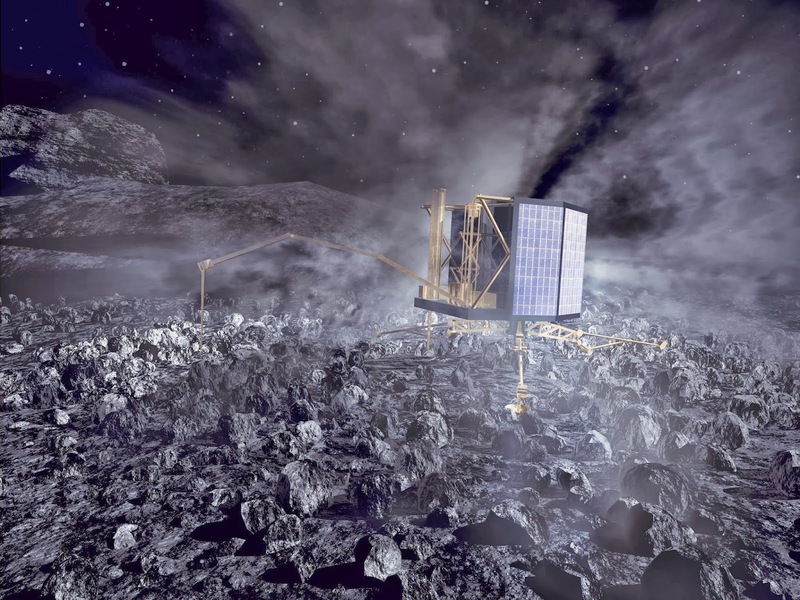 One approach, firing anchoring devices into the surface, is being implemented on the Philae lander on the Rosetta mission to land on comet 67P/Churyumov–Gerasimenko. We decided that this approach is too high risk for OSIRIS-REx, since all of our astronomical data suggest that surface of Bennu is covered in loose gravel. This uncertainty in surface properties made designing a fail-proof anchoring system extremely difficult. 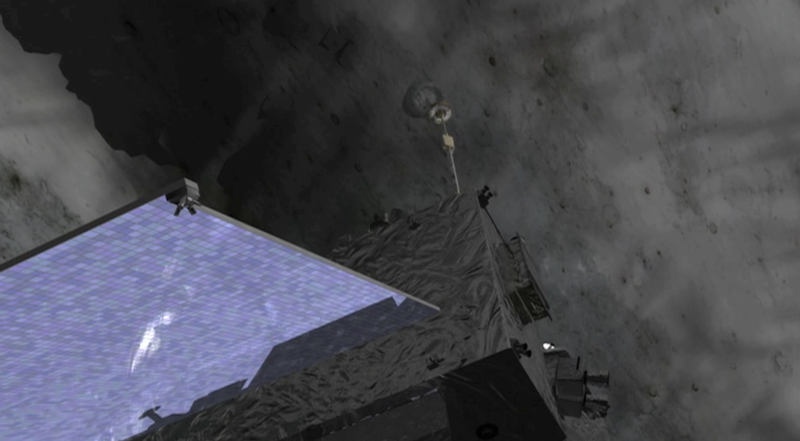 The Philae lander uses harpoons to anchor the spacecraft on the comet surface. We also investigated using hold-down thrusters to counteract the tendency of the spacecraft to bounce off the surface. However, one of our top mission objectives is to study the organic chemistry of a B-type carbonaceous asteroid. Constant thruster firing during surface operations would result in an unacceptable amount of sample contamination. Even if we solved the problem of safely landing on the asteroid, surface operations would be highly complex. Bennu rotates every 4.3 hours. Since it does not have an atmosphere, the surface can heat up to 65 ˚C (149 ˚F) and cool down to -150 ˚C (-238 ˚F) in this short time period. Such rapid thermal cycling presents an almost insurmountable engineering challenge for keeping the spacecraft equipment at its operating temperature. 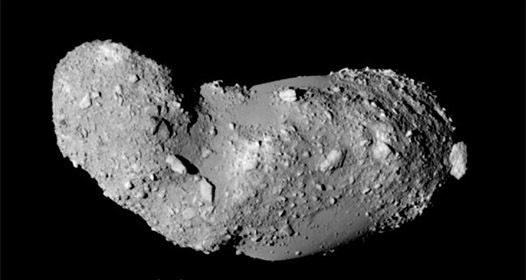 In addition, we fully expect that the surface of Bennu has boulders, craters, scarps, and other topographic features, similar to the surface of asteroid Itokawa. This rugged surface would present a communication challenge; even small features would block our antennas. All of a sudden mission complexity goes way up, since we would need a second spacecraft to serve as a communication relay to Earth. For OSIRIS-REx, we chose to eliminate all of these risks by using a short-duration contact TAG for sampling. The surface of an asteroid is a harsh environment for spacecraft operations. Once we decided to implement a TAG approach to collect our sample, the next decision focused on the method of sample acquisition. To solve this problem, the team studied many different techniques, including contact pad samplers, claw and clamshell samplers, drive tubes, augers, coring drills, scoops, rakes, and gas-stimulated sampling. We decided to implement two complementary sampling strategies – contact pads and gas stimulation. Either one is capable of acquiring enough sample to meet our Mission Success Criteria. I will discuss the details of the TAGSAM design in a future post. Designing the trajectory to bring the spacecraft down to the surface of Bennu is one of our most challenging tasks. For most of the time that we are at Bennu, OSIRIS-REx is in our so-called “Safe-Home” orbit. Safe-Home is a circular orbit with a radius of one kilometer (0.62 miles) in the solar terminator plane orbit – meaning we continuously fly over the dawn and dusk sides of the asteroid. Getting from Safe-Home orbit to the asteroid surface requires us to fire our rocket engines three different times – once to leave orbit, the “De-orbit” burn, once at our “CheckPoint” altitude of 125 meters (410 feet), and once at our MatchPoint altitude of 45 meters (148 feet). Our original plan was to design each of these three maneuvers in advance, then let the spacecraft execute each one in sequence as planned. However, as we got into detailed mission design, our analysis revealed that this approach would not meet our requirement of sampling within 25 meters (82 feet) of the chosen sample-site location. It became obvious that we needed another solution to fly the spacecraft to the asteroid surface. The task of designing a new strategy fell to the OSIRIS-REx Flight Dynamics team – composed of team members from Goddard Space Flight Center, KinetX Aerospace, and Lockheed Martin Space Systems. The team applied their creativity to develop a solution to this problem. They decided that there needed to be a calculation performed on board the spacecraft to correct for the errors introduced after the de-orbit burn. They strove to find an answer that was simple and could be run on the spacecraft computer quickly and with minimal use of memory and processor time. The outcome of these efforts is a simple, yet elegant, on-board guidance scheme that uses information obtained from our laser altimeter – a device that measure the distance between the spacecraft and the asteroid by firing a laser at the surface and measuring how long it takes to bounce back. Basically, they informed me that they wanted to play laser TAG with Bennu! The OSIRIS-REx Flight Dynamics team invented the laser TAG method. 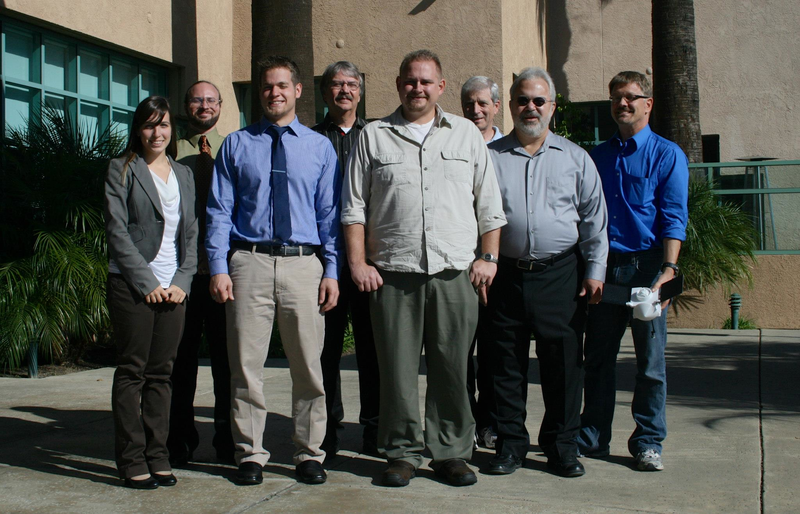 From left to right: Coralee Jackman, Brent Barbee, Kenny Gentzandanner, Bobby Williams, Kevin Berry, Phil Dumont, Ken Williams, and Brian Sutter. So how does this game work? The spacecraft begins the TAG sequence in the Safe-Home Orbit. We chose the latitude and timing for orbit departure based on our chosen sample site. When the spacecraft crosses this latitude on the morning side of the asteroid, the de-orbit burn is performed with the goal of arriving at the 125 meter (410 feet) altitude CheckPoint position four hours later. 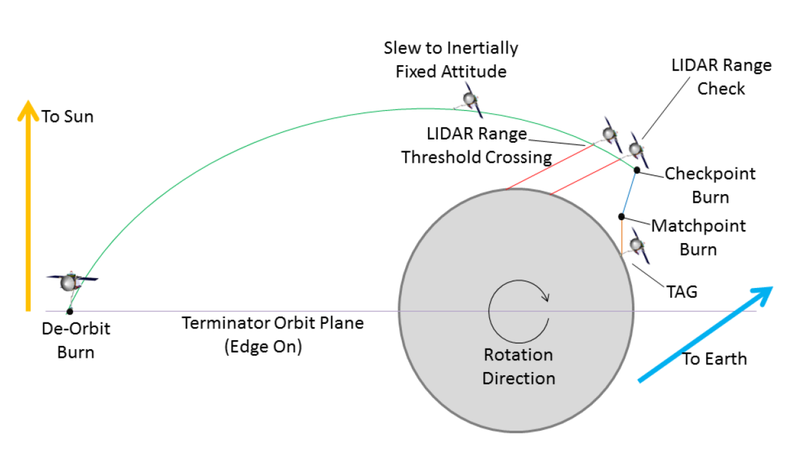 The de-orbit maneuver is a turn-burn-turn maneuver, meaning that the spacecraft will point the main thrusters in the burn direction, fire the thrusters, then slew back to the proper orientation. If the slewing and thruster firings go exactly as planned, then the spacecraft will arrive at the CheckPoint at the right time and the engines can fire as originally planned. However, there are errors that can be introduced at each step of the process – the spacecraft might not slew to the exact right position, the thrusters might not fire at exactly the right time or for the right duration, and the engine power may fluctuate – resulting in too little or too much thrust. Our laser TAG strategy is designed to assess the errors introduced at the De-orbit Burn and use that information to compensate for them at the CheckPoint Maneuver. After the spacecraft leaves orbit, the laser altimeter will be pointed off into space. Approximately 25 minutes before the CheckPoint is reached, the laser beam will cross the limb of the asteroid and the altimeter will begin detecting the reflected laser light. During this 25-minute span the spacecraft computer will analyze the laser altimeter measurements and use that information to redesign the CheckPoint Maneuver. The first measurement that we will take is the “Range Threshold Crossing” time. When the laser beam crosses the limb, the distance to the asteroid will be approximately 250 meters (820 feet). By measuring the time at which this range crossing occurs we will get an initial assessment of how far off track the spacecraft has become as a result of any errors associated with the De-orbit maneuver. The second measurement is the “Range Check Distance”. Two minutes before the nominal CheckPoint time, we will take another laser range measurement. Since the CheckPoint is nominally 125 meters (410 feet) above the surface, the Range Check Distance should be close to 130 meters (426.5 feet). Any variation in this value from our predicted range will provide a second measurement to determine if the spacecraft is on track for the planned CheckPoint. When the CheckPoint position is reached, a maneuver is performed to cancel out the motion of the spacecraft relative to the asteroid surface – basically making the spacecraft hover over our chosen sampling location. At this point OSIRIS-REx is no longer flying over Bennu and instead has begun his descent towards the surface. Ten minutes after the CheckPoint maneuver, the spacecraft will reach the MatchPoint at an altitude of 45 meters (148 feet). The MatchPoint maneuver reduces the rate of descent sufficiently to achieve a TAG vertical velocity of 10 centimeters per second (4 inches per second). The CheckPoint and MatchPoint maneuvers are targeted together to achieve the ideal TAG conditions. TAG occurs approximately 8 minutes after the MatchPoint maneuver. This solution is a testament to the creativity and skill of the OSIRIS-REx Flight Dynamics Team. This task is just one example of the many complex flight dynamics problems presented by OSIRIS-REx. Fortunately, we have a team that is not only capable of solving these problems, but also relishes the challenges posed by our mission. Berry, K., Sutter, B., May, A., Williams, K., Barbee, B.W., Beckman, M., Williams, B., 2013. OSIRIS-REx Touch-And-Go (TAG) Mission Design and Analysis. 36th Annual AAS Guidance And Control Conference, February 1 – February 6, 2013, Breckenridge, Colorado.